This week CT and I are joined by Robert from To the Escape Hatch to continue or discussion from episode 155 in which we are talking about the X-Men movies. This time we discuss the two most recent movies, X-Men: First Class and X-Men: Days of Future Past. We talk about what we liked and what we didn’t like. The casting and the movie settings. We even go into a little bit of discussion about the next X-Men movie, Apocalypse. Here we are at issue #7 of Cavalcade Comics’ Vintage Comic Throwdown! This month I’m taking on a different type of comic cover…the painted cover. These types of covers were very prominent in the 60s and 70s. Plus, I used this opportunity to give the logo and the corner box a bit of an overhaul. I may go back to the older version, but I like this new one too. For the actual cover battle, I decided to use one of my favorite absurd characters from back in the day. He’s just one of those kooky, high concept characters that could have only been created in the 60s. So, without further ado, here’s Magnus Robot Fighter. And he’s trapped on the infamous Skull Island. In case you didn’t know, Magnus is from the future. He’s from a future where robots have enslaved humanity. He is taught by a robot how to fight other robots and also how to harden his hands to punch and slice through metal. So, Magnus goes on a robot killing rampage to free the future human race. I thought it would be interesting to take this character that’s so identified with fighting robots and place him in a place where there are NO robots. Hello, Magnus, have you met…Skull Island? 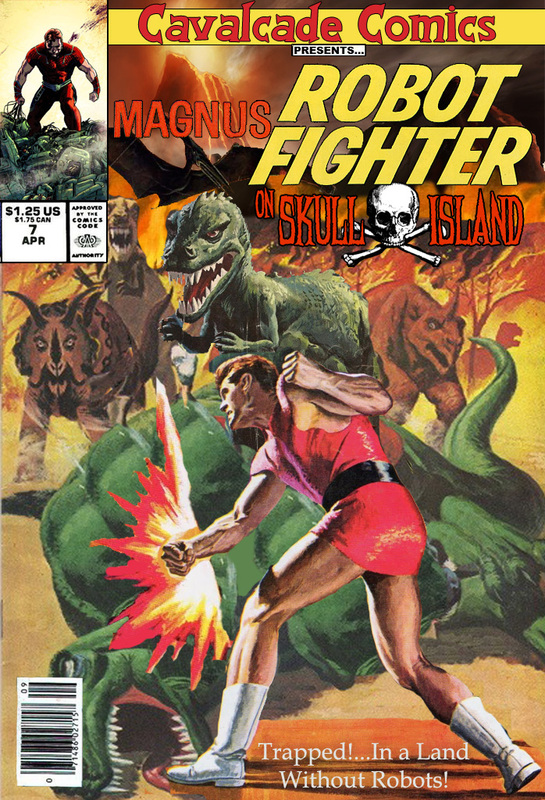 Magnus Robot Fighter vs Dinosaurs seemed like a winning concept to me. Plus, I love the tagline I created at the bottom, “Trapped!…In a Land Without Robots!” It was one of the first things that popped into my head and I couldn’t get it out until I finished this cover. Behind the scenes…I used several different covers to bring this masterpiece to life. Magnus himself comes from Russ Manning’s Magnus Robot Fighter #7 (1963). As you can see I took pretty much only Magnus from this cover and the laser blast on his back I converted to the fist burst for his punch. The rest of the comic was pieced together from several different issues of Turok Son of Stone with most of the elements coming from issues #35 and #90. I may have also taken a stray Pterodactyl and a volcano from some other nameless Turok issues. I can’t remember, it all sort of blended together at the end there. I still have at least three of these covers stashed away for future use. One of those covers is a very special holiday issue. Either Memorial Day or July 4th. I haven’t decided which just yet.